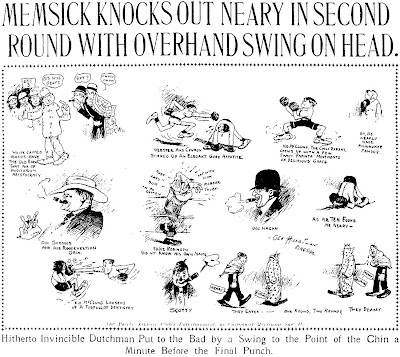 These cartoons ran on November 13-15 1906. On the 13th we have a caricature of an infamous bookmaker of the day, on the 14th an account of a night of boxing. 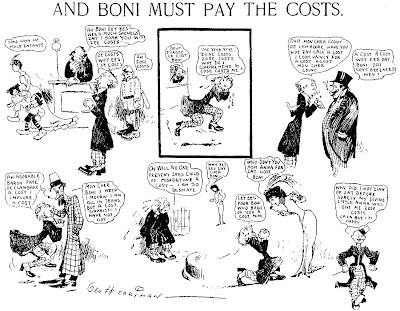 On the 15th we have a cartoon about Count Boni de Castellane who was going through a sensational divorce at the time. Here's a site with lots of info on Boni. The bottom two cartoons were in pretty bad shape; I had to do some pretty major surgery to get them reasonably presentable. Chalk up any bad drawing to me, not ol' Garge. That exaggerated foreshortening in the first picture looks odd. Flagg's Uncle Sam was a World War 1 recruitment poster and thus a few years later. Anything photographic would have shown a much smaller hand. What would have been the standard for such a thing at this time? I really can't think of anything analogous off the top of my head. An extra special item today; a 1932 essay by Robert Benchley on the state of the American press. A perceptive and thoughtful review from a gifted writer who was, we sometimes forget, a veteran of the fourth estate. This essay originally appeared in an obscure book titled "America as Americans See It" and to my knowledge, after an assiduous search, has not been reprinted since. (For that reason I'm assuming that it is in public domain.) Benchley is one of my favorite writers and I'm proud to present here a work all but lost in the mists of history. It takes not great perspicacity to detect and to complain of the standardization in American life. So many foreign and domestic commentators have pointed this feature out in exactly the same terms that the comment itself has become standardized and could be turned out by the thousands on little greeting-cards, all from the same type-form: "American life has become too standardized." This is a pity, for I would like to have invented the phrase my­self for use in writing of American newspapers. Our Ford cars may be all alike, our horn-rimmed glasses may be all alike, and our musical comedies may be all alike, but they are a motley assortment of variegated odds-and-ends compared with the uni­versal sameness of our newspapers. Which probably explains why our two leading political parties are indistinguishable from each other (Republicans are possibly more blond than Democrats, but, aside from that there is very little difference) and why the most popular newspaper in any given city in the United States is the one which carries the syndicated comic strip "The Gumps." I am speaking, of course, of the United States as a whole. The newspapers in New York City manage, by dint of rearranging type and using different comic strips, to maintain a show of indi­viduality, although to a blind man who has to have his newspaper read aloud to him, even this would vanish. Then, too, there are exceptional papers, like the New York Times, the Baltimore Sun, the Kansas City Star, the Boston Transcript or the Christian Science Monitor, which through the fostering of old standards or the maintenance of new ones, combined with distinctive make-up or editorial individuality, have managed to make themselves at least distinguishable from the general run of journals on a newspaper-rack. They are not all good newspapers, mind you, but they are at least different. As a rule, however, a man from Buffalo, New York, who found himself by some unhappy circumstance in Los Angeles, Cali­fornia, could pick up a Los Angeles newspaper and read it through without noticing any difference between it and his home­town paper. There might be a momentary confusion at the dif­ference in typography, but the news would be the same (except the local news which, in a strange city, he would skip anyway), the syndicated features would be the same and the editorials, while possibly not word for word identical, would certainly not throw him off the track by their originality. In some towns they would actually be the same editorials, shipped in matrix form to all newspapers subscribing to the same editorial service. It is these great news services which feed the journals of the country which are responsible for a large part of this standardiza­tion. The Associated Press, which serves 1,250 papers, has repre­sentatives all over the world, besides practicing the incestuous feat of deriving news from within its own family. For the "A.P." is something of a club, with limited membership, a non-money-making institution existing solely for the mutual propagation of news among its members and the cooperative gleaning of information throughout the world. It is supposed to be non-partisan, as its membership includes papers of both political parties, but, in times of what its sponsors consider national emergency, it has been known to exercise a certain paternal censorship in the mat­ter of what news shall be sent out over the wire and what shall not. Thus we have the inspiring thought that on the same evening, throughout the broad land of America, readers of 1,200 news­papers are not only reading the same account of the current dis­armament conference, but are in unison devouring the same story concerning the quaint way in which Chinese girls dress when their sisters are married or about the little dog in a French town who swam through the flooded area to rescue its master's hat. Is it any wonder that America presents a united front to the world in matters of sentiment? These four services, together with those syndicates which are devoted entirely to enlightening the country from coast to coast with stereotyped humorous articles, comic strips, gossip-columns, and sermons for daily spiritual needs, put the finishing touch on the standardization of the American press. In New York City where, with a few exceptions, the only real newspapers in the country are published, there is still another factor which reduces news-gathering to a mechanical reaping and binding like the preparation of wheat. An organization called the City News Association serves the press of that town with a con­cise and factual account of almost every event of importance taking place within the city walls. A newspaper may send its own reporter out on the story or rewrite the City News account (which comes in over the ticker, like stock-market reports) to suit the individual tone of the journal itself, but, in case the reporter happens to be looking in the other direction when an important event takes place, or if there are no reporters handy to send out on the story, the City News may be relied upon to give the unembellished facts. With this great impersonal mass of machine-gathered news coming into a newspaper office, it will be understood why the reporter is becoming less and less important. And this degrada­tion of the reporter is one of the most serious factors in weaken­ing American journalism as a force while strengthening it as a business proposition. There is no class of American professional men of equal intelligence and ability, working every day regu­larly, who are as poorly paid or as badly treated as the news­paper reporters. The result of this is that eighty per cent of them consider their jobs only as stepping stones to opportunities in other lines where the financial remuneration will pay them for their apprenticeship. This attitude of mind on the part of the men who are getting out our newspapers does not make for the fostering of great journalists or the maintenance of an impor­tant journalism. The sentimental side of newspaper life has been stressed in magazine fiction and reportorial legends until there is a general feeling, even among laymen, that the reporter's life is a romantic and happy one. The bustle of the City Room, the clatter of the presses, and the smell of the ink, all have been played up in the memories of those once connected with it until "the Newspaper Game" has become something with as many tender associations as the Old Oaken Bucket or the Swanee River. The affectionate term "newspaper game," however, is heard most often from the lips of those who were formerly engaged in it and who are now working for more money in other fields. There is a great deal of talk about how they wish they were back "in the Old Newspaper Game." But you will notice that they never go back. The youngest, or "cub," reporters are usually just out of school and are looking for "experience." Possibly the more sentimental have hopes of some day becoming a "star reporter" or maybe a great editor, but for the most part they are young men with an eye for the future in publicity-work, scenario-writing, short-story manufacture, or political "easy money." The ideal progress for a newspaperman has recently been exemplified in the case of an ex-press-correspondent who became secretary to the President of the United States and then, as the next step up, was offered a job with a motion picture concern at three times his government salary. This is the reporter's ideal march to a Heaven on Earth. Occasionally you will find a young reporter who hopes even­tually to be a columnist (with syndicate possibilities which would bring him in almost as much money as he would get in the movies) or even who has. God help him, an ambition to become a dramatic critic. For one of these reasons he is willing to stick to the grind and poverty of newspaper work at the bottom of the ladder. Thus inspired, he tries to attract attention by injecting what is known as "personality" into his style in reporting the drab events of the day. Fortunately, most of this "personality" touch is deleted by the disillusioned editors on the Copy Desk before it reaches the printed page, otherwise our newspapers would be quite unread­able. Too much of it is allowed to get by as it is. The older reporters, if they have not become "special writers" who sign their own names to their copy (a distinction which is becoming less and less of an honor with its widespread distribu­tion) or who are not on their way to the good newspaperman's goal - political correspondence in Washington - are more grimly in earnest in their search for "something else." They have tried short-stories "on the side" and perhaps failed. They have possibly dabbled in theatrical press-agent work and found it a broken reed. They are now rather bitterly hanging onto the jobs they have, with a weather-eye out for those openings which good newspaper­men have so often slipped into: "public relations counsel" for a Wall Street firm or a public-service corporation (a "public rela­tions counsel" is a press-agent who gets more than $15,000 a year), private secretary to some big man in public office, or, if Heaven is good, an offer to go to Hollywood and write for the movies. The chance of becoming a sub-editor on their own paper is not sufficient lure to keep their eyes away from the Great Outside. And why should it be? At best they can make only a small frac­tion of what they might make elsewhere, and even then they would be constantly under that sword of Damocles which hangs over all newspapermen, editors, and reporters alike, the danger of the paper being sold, or merged or discontinued, with a result­ant dismissal of the entire staff with no more notice than one would give the man who comes to shovel snow from the sidewalk. Labor unions among professional men are not considered good form, but if ever a union was needed to protect its workers and to regulate their wages, a union of newspaper-workers is that one. This state of affairs has led to an almost complete elimination of competition among news-gatherers. The old-fashioned "scoop," or exclusive story, is almost non-existent now in a large city, owing to the fact that the reporters are more interested in fair-play to each other than they are in furthering the interests of their respective papers. In the first place, even if a newspaper does secure an exclusive story which appears in its first edition, the other papers have picked it up by the time the late city editions have gone to press and the public knows nothing of any en­terprise or delinquency in any one journal. The reporters, know­ing this, club together on a story, and, in the event of a riot or a parade or a fire, it is no uncommon sight to see the men from all the papers in the city getting together in a "huddle" before turn­ing in their stories to check up on the statistics of the event, so that all accounts will agree and no one paper will come out with facts which diverge to any startling extent from the rest. A re­porter who holds out on his colleagues and turns in a story with additional facts which he himself has secured, will find himself not only unpopular but unable, when he needs it, to get help from the men he has "scooped." And anyway, why should he be particu­larly loyal to his own sheet? Is his own sheet loyal in any way to him? The American newspaper, therefore, comes to us as a machine-made, stereotyped, efficient and, with few exceptions, entirely trustworthy, typographical arrangement of the news of the day. Its features, such as personal columns, comic strips, service de­partments, and sporting pages are its money-making assets, and the American newspaper is naturally out to make money. Its chief political influence on the public mind comes through its political cartoons, for the American public is not much given to reading editorials, and, even if it were, it would find little of distinction to read. The editorial writers of most of our newspapers are men of considerable intelligence, but they, too, have felt the deaden­ing hand of the machine-made newspaper and the stuff that they turn out is, for the most part, colorless and uninspired and con­cerned with general matters such as tonsilitis and snow-removal. There are certain subjects, also, on which a firm editorial stand is taboo, varying, of course, with the individual papers, but when the Pope issued his encyclical on Chaste Marriage only one New York paper (the Times) commented on it editorially, in spite of the fact that it presented a rich vein for controversial writing. Religion is too dangerous a subject for editorial treatment and might affect the circulation. There is one field of American journalism which might well be made the subject of a whole article-the tabloid, or picture-paper. The tabloids are, however, not strictly newspapers in the sense that the Times or Herald Tribune are newspapers, as they make no attempt to cover any news which cannot be sensationalized or adapted to the camera's uses. They are more in the nature of daily magazines, and very low-class magazines at that, and their standards of veracity and journalistic ethics are so low that they have established a class by themselves quite outside the pale of newspaperdom and magazine editing. Their popularity is enor­mous, as a large percentage of the reading public does not read but looks. And if they can buy a sheet every day which will give them something spicy or startling to look at, their contemplation of the world's affairs is taken care of for the day. Some years ago the Chicago Tribune in an attempt to do something with its mil­lions of dollars which might reduce its income tax to the Gov­ernment, established the Daily News in New York with the frank intention of losing money on it [I've never heard this claim before - if it's true it was a well-kept secret - Allan]. This tabloid, however, refused to lose money and became a veritable gold-mine for the Tribune, for it was exactly what hundreds of thousands of "readers" wanted. Since then the Graphic and the Mirror have entered the field and have so far outstripped the News in sensationalism (al­though not in circulation) that the News is now comparatively respectable. Other large cities in the country have taken up this form of journalism and the public is now supplied with its full quota of murders, divorces, rapes, and gossip without having to take the trouble of looking through columns of international or civic news to find it. It is probably a bad sign of the state of the public mind, but what isn't? To return to the legitimate press of the country, which should be a great force in the molding of public opinion and the foster­ing of vital writing, and we find it a business proposition of in­creasing efficiency, given over to circulation schemes and the gathering of millions of lines of advertising, efficient but color­less in the presentation of news, generally artistic in typographi­cal make-up (except for papers like those belonging to Mr. Hearst which are abominable hodge-podges of type-matter) and, in comparison with most French and many English papers, para­gons of clear-cut and comprehensive journalism. The American press is also, for the most part, free from venal influence and increasingly unbiased in its news-writing. Of course, it is open to persuasion in the matter of running innocuous publicity fur­nished to it by the hundreds of publicity organizations which every day send out tons of "flimsy" marked "For release Monday, please," and a big advertiser is usually a little more successful in "landing" a picture of his daughter in the rotogravure sections than an ordinary citizen would be. The Government, too, is favored with space in the news columns whenever it wants to dis­guise its propaganda under the head of "news." But all this propaganda and publicity to which the papers lend their col­umns is generally harmless and designed "for the public's good" and is usually detected by its unimportance and dullness as read­ing-matter. On the whole, we may say that the American press is free (with certain obeisances to the advertising department), honest according to its liglits, and wholly uninspired. We are told that the day of personal journalism has gone, and that the great personal journalists like Greeley, Dana, and Bryant would be out of date if they were alive today. Perhaps this is true, but we have no way of knowing, for there are no great per­sonal journalists alive today to act as test cases. And the reason that we have no great journalists is that the Newspaper Game has become the Newspaper Business, and, since Business has been adopted as the criterion, those who might have become great journalists have gone into business for themselves in other fields. Given that this is 1932, and the Sun would exist for another 18 years (before being bought by the World-Telegram), I suggest that the paper being referred to is either the James Gordon Bennett-linked Herald, or the Horace Greely-linked Tribune, both of which merged ca. 1926 to form the Herald-Tribune. The Herald had a notable comics section (it was the home of both Winsor McCay and Earl Hurd), and I believe the Trib also was significant in syndication, albeit not in cartoons. A third possibility is the Joseph Pulitzer-linked World, which was bought out by the Telegram (see above) in 1931. The World had significant syndication (plus the World Almanac) under its Press Publishing moniker, and was a major force in comics at the turn of the century (until the Hearst raids), but the Pulitzer heirs had milked it and didn't reinvest any money. See the book "The End of the World" for more details. I think Benchley's comment that the paper was founded by a great journalist puts the World and Herald out of the running. The Trib, however, is a distinct possibility. I guessed that the Sun, with Benjamin Day at the helm, would have been Benchley's darling since it aspired to literary as well as news-gathering greatness. Having come under the control of the hated Munsey it limped through the 20s starved for cash, eventually being sold outright to the employees. Here we've arrived at Thanksgiving and, as usual, I forgot to put aside something special to post for the occasion. So I go riffling through a few of the more accessible piles this morning and, whattayaknow, I came pretty close. Okay, okay, Rhode Island Red isn't a turkey, he's a chicken, I know. Use some imagination for cryin' out loud. Rhode Island Red was by George Lemont, and ran Sunday only from October 28 1962 to June 26 1966. The star of the show was Red the chicken, the remainder of the dramatis personae being an assortment of other barnyard denizens. The strip was renamed to Feeny Farm with Rhode Island Red on September 19 1965, then shortened to just Feeny Farm after November 7 of that year. I guess the chicken just wasn't making it in the leading man role. "Now you see it — now you don't!" 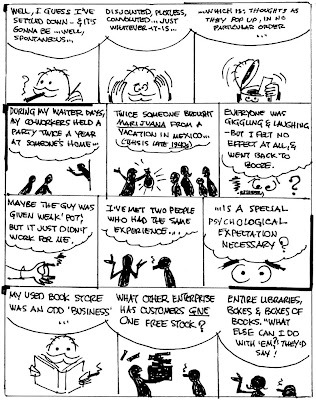 Doesn't sound like much of a sales line, but it's the one Jeff Hayes uses—and uses success­fully—to sell his new comic strip. Editors who aren't already buy­ing "Chip" from Consolidated News Features can expect Mr. Hayes, a small man with a disproportionately large smile, to drop in any day now, give a quick— and unique—ren­dition of "Yank­ee Doodle," and run through a dozen or so pro­fessional magic tricks. Odds are that they'll enjoy the show. Odds are that they'll pay for it by buy­ing "Chip." "Cartooning is my work," Mr. Hayes explains, "but selling is my hobby. I love to sell." "Chip," now in its third month, is appearing in more than 50 newspapers, many of them sold by Mr. Hayes himself. If side-show sleight-of-hand doesn't sound like much of a reason for buying a new comic strip these days, the secret of "Chip's" success may be found in its size. A new addition to the recent crop of "space-sav­ers," each day's release consists of only two panels about two inches high. They may be used vertically or horizontally. "It's something I've been look­ing for for a long time," admits Mr. Hayes. "A half-size comic strip, ideal for a naturally lazy man like me." "Chip" follows the trend in more than size. It's gag-a-day strip fea­turing kid humor, which is rapidly replacing science fiction as the number one comics vogue. Gags are "corny but cute." Typical ex­ample: "Never forget, son, we are here to help others." "What are the others here for?" Mr. Hayes, a native of Newburgh, N. Y., came to New York City in the twenties to study at the Art Students League or, as he puts it, "to bum around for a while." Later he joined the ad­vertising art staff of the New York Journal, where he stayed for 12 years. After a stretch of comic book work for King Features, he joined Consolidated News Features as general art handyman, doing sports and editorial cartoons and, at one time, three daily comic strips—"Pop," "Silent Sam" and "Witty Kitty." Besides "Chip" he still does "Silent Sam," also known as "Adamson's Ad­ventures." In addition to his selling trips, Mr. Hayes frequently takes to the road to deliver chalk talks and make personal appearances. Here he is often helped by his 17-year old daughter, an art student. "She draws much better than I do," Mr. Hayes admits. I enjoyed the article on Jeff Hayes.I am his granddaughter, the daughter of that 17 year old girl mentioned at the end of the story. Do you have any other information on Jeff Hayes or his work? This i an old post, but if you see this, i would like to get i touch with Jeff Hayes ganddaughter. I am writing about comics i Denmark. 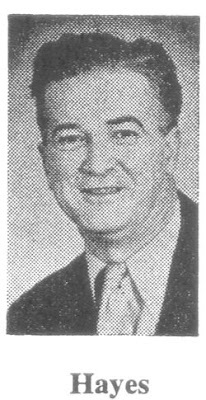 Lou Fine was, along with Kirby and a few others, the royalty of golden age comic book artists. His work was revered then and continues to be now. His fine line and dramatic staging made any comic book his work graced a transcendent piece of dynamic illustration art. Unhappily for comic book fans, Fine's work was just too good not to be noticed at higher levels of the New York publishing world and he abandoned the funnybook trade in the mid-40s to work primarily in the field of advertising comic strips, presumably a much better paying gig. For ad strips he modified his style making it slicker and far less dynamic -- perhaps considered more appropriate for his new genre, but a big disappointment for his fans. Fine dabbled in non-advertising strips, too. He drew Adam Ames from 1959-1962, and, according to Ron Goulart, a strip called Taylor Woe in the late 40s (the strip was advertised in E&P in 1945 but I've never found a single example - anyone seen it?). 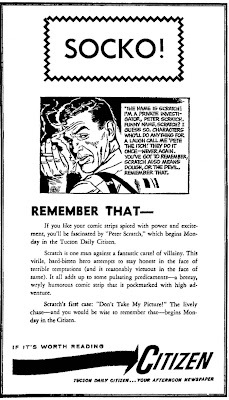 Fine's last newspaper strip was Peter Scratch, a hard-boiled detective yarn. Reading like Mickey Spillane, it probably seemed out of date when it debuted on September 13 1965. It was syndicated by Newsday, a Long Island newspaper that for awhile in the 1960s tried to get into the syndicate business with limited success. The strip ended sometime in 1967. Unfortunately I haven't found an exact end date for the strip. I have read and enjoyed most of Peter Scratch in the Menomannee Falls Gazette, but I had never seen a sunday. Thanks for that. I wouldn't mind if you added what paper you found the sample. Along similar lines, I enjoyed Frank Thorne's detective slightly more. Maybe you can do a follow up on that one? The Sundays shown here came to me as clipped tearsheets so I don't know what paper they're from. Presumably you could find the Sunday run in Newsday itself though, for one. Perry Mason will undoubtedly pop up here one of these days, but the content of the blog is mostly determined by what I have handy for scanning at any given moment. For want it's worth, I've found Adams Ames via NewspaperArchives in Winnapeg Free Press 1961-62 and in Appleton (WI) Post-Cresent in late 1959. Never seen Taylor Woe. And never seen Perter Scratch Sundays (until now). Thanks!! Sorry I was unclear in the article. It's just the Taylor Woe strip that I haven't found. A young Canadian now living in England, described as "a stu­dent of applied relaxation," is the creator of a very different comic strip which American newspaper readers are just beginning to get accustomed to. The artist is Wally Fawkes, better known as Trog, and his strip is "Flook," which Gen­eral Features Corp. introduced here last fall. Just what makes it difficult to get used to "Flook" is not quite clear, but it isn't just the fact that the strip is British. The London Daily Mail, which launched "Flook" several years ago at the suggestion of Viscount Rothermere, ran into the same trouble. According to Stuart McClean, managing director of the Daily Mail, " 'Flook' is something unique in strip cartoons, and newspaper readers have to live with him for quite a time before they take him to their hearts. We were not at all happy about him during his first four or five months in the Daily Mail but suddenly he became fa­mous . . . 'Flook' has become one of the foremost attractions in the Daily Mail, and we regard him as one of the greatest strip cartoons of all time." The "Flook" in question is a tubby, panda-like animal with a short trunk, sawed-off arms and legs, the ability to speak seven languages, and an uncanny faculty for changing himself—or itself— into anything and everything on a moment's notice. Accompanied by Rufus, a small boy who was origi­nally the strip's central character, the "Flook" stumbles into an un­ending series of far-flung and fantastic adventures. Versatile as the "Flook" is, he is no match for his creator. When not studying applied relaxation, Trog—the pen name is short for "troglodyte"—studies serious art at London's Studio Club, goes on re­search field trips for "Flook" or plays the clarinet at the Humphrey Lyttelton Jazz Club. Critics have commented on his "uncanny musi­cal understanding," and the car­toonist says music is much more important to him than art. Trog was born 28 years ago in Vancouver, Canada, but moved to England with his family at the age of seven. He attended several art schools and did commercial illus­trating until an art contest entry landed him a job on the Daily Mail in 1945. He drew column breaks until "Flook" got off to its reluc­tant start in 1949. Robert Raymond now writes the continuity for "Flook," but he ad­mits that "the last word is Trog's. 'Flook' haunts his morning tub, squeezes out of his tube of tooth­paste and bobs up when he cracks his breakfast egg," Mr. Raymond says.